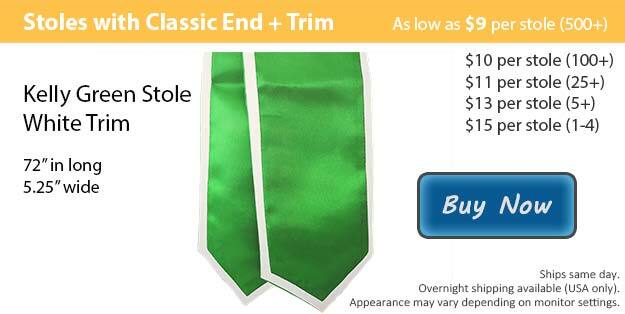 A kelly green stole with white trim is a magnificent way to pull your outfit together perfectly for your big day. Here at Honors Graduation we have everything that you need to get ready for your graduation ceremony. It is a tradition followed by students all around the globe to wear a graduation cap and gown at the time of their ceremony. Members of your family and some of your closest friends will come from all over to be there for you, cheering you on and helping you enjoy your celebration. It is important to dress the part as you accept your degree or diploma. You have put in so much effort over the years in order to successfully make it this far, be sure to get all of your gear together in time. To help yourself stand out for a special achievement or unify the team or club that you are apart of, our graduation stoles are exactly what you are looking for. Over the years, many students have been known to accent their wardrobes with our graduation stoles for various reasons. Here at Honors Graduation when it comes to options, we have plenty. You can choose your style, color, and length for your graduation stole to help create the perfect one to go with the rest of your attire. We have over fifteen colors that you can mix and match for your stole color as well as the trim that goes with it. Each of our stoles can also purchased without the trim for a solid colored stole. We have two styles to pick out of, there's the classic option as well as the angled finish. Both styles are available in lengths of either 60 or 72 inches. All of our stoles can also be customized. Our customization team uses embroidery to add the image or wording of your choice directly onto your graduation stole.